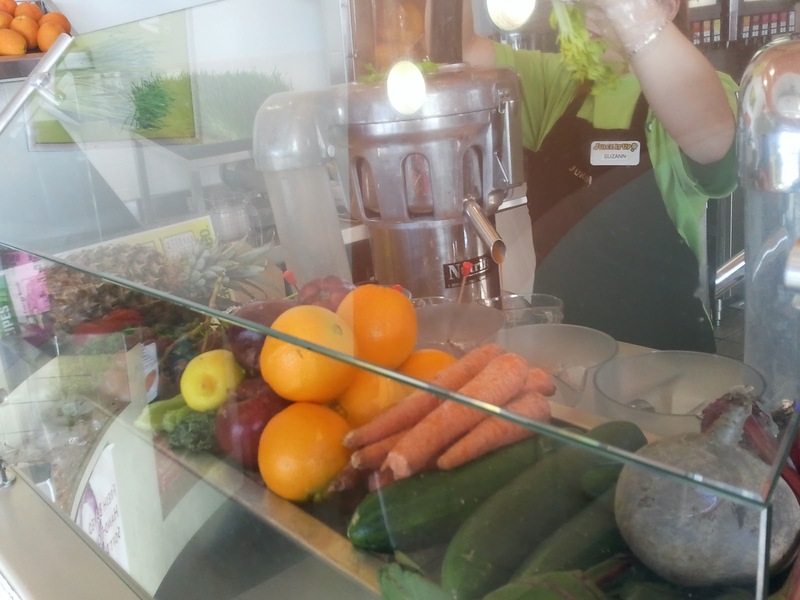 Real Juice At Juice It Up! We had a lot of errands to run today so I figured I would stop into the Hesperia Juice It Up! and get some wheatgrass. The one in Apple Valley was out of wheatgrass the last time I was there so I was really overdue for some of this green goodness. If you don’t know all about wheatgrass and how wonderful it is for you, here is a link that you have to check out! Here’s a fun fact for you. I use to juice all the time. At least once a day, for years! Then I slacked and then I’d get back to doing it. Yada, yada, yada. Well, ever since my juicer died on me, I’ve missed it. Terribly! I just haven’t had the time or money to fork out for a new one yet but I will very soon. In the meantime, you can imagine my excitement when I walked into the store and saw this! Juices!! And not just the carrot, apple, orange juices either! Real juice bar type of stuff. Cucumber, beet, parsley, kale…the stuff you can only get at least an hour away, was here! I asked the lady behind the counter if ALL of the Juice It Up! stores had changed and she told me that they are the only ones up here that offer this. Well, let me tell you what! This will be the ONLY Juice It Up! I go to from here on out. I finally decided to order the Healthy Heart juice drink that was a mix of fresh carrot, celery, parsley, bell pepper, scallion and lemon. Plus, a 2 oz. 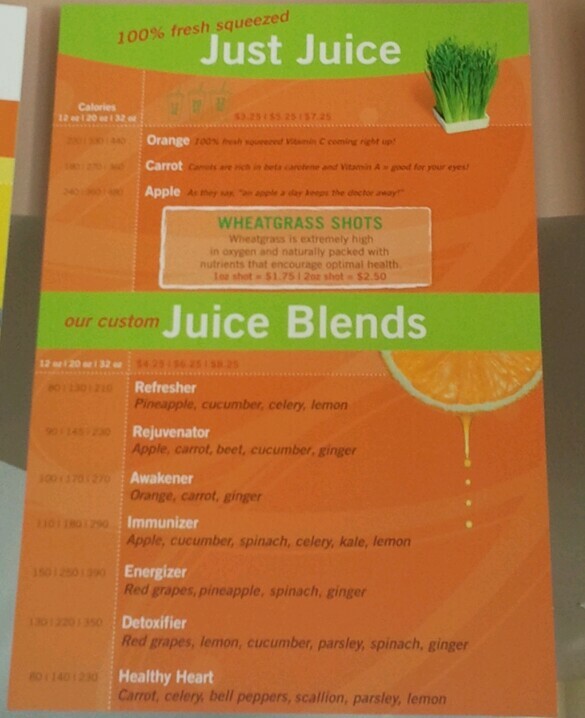 shot of wheatgrass and a small orange juice for my Riley. I was so excited that I was snapping pictures like a crazy person! 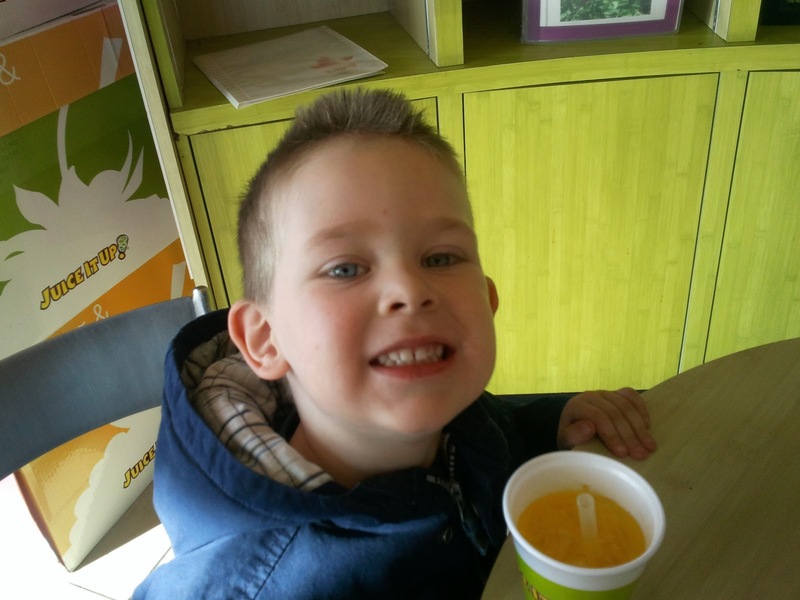 He liked his orange juice! Running errands with two wees is no joke. This gave me the energy boost I needed to get through my morning! Way more then coffee ever could. It felt amazing! Its times like these that make me feel so strong and so proud to be living and thriving on a whole foods, plant-based diet. 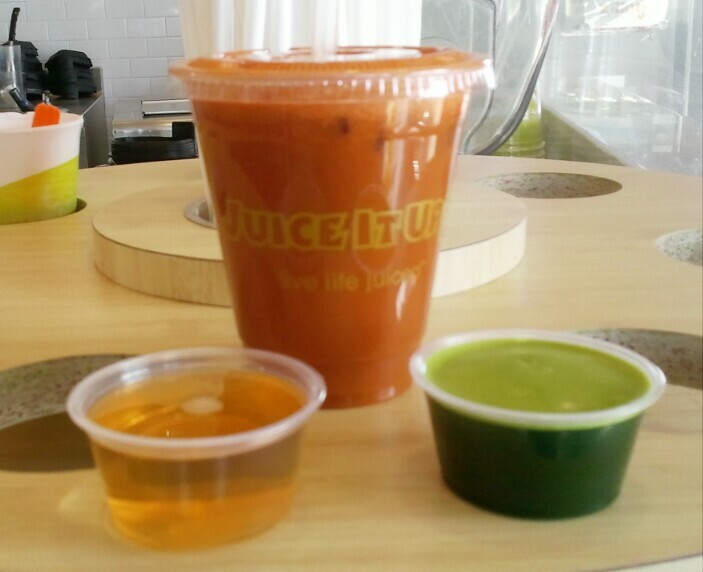 Regardless of the lifestyle your living, I highly recommend you try some fresh juice and wheatgrass. Your body will thank you for it, I promise! Go, plant power! !